While some of our members had never realized there had been a change in our name, many did. During our attempt at re-organization we gave the original IHPVA name to the newly formed committee that was to oversee the “association of national clubs” and our original club assumed the HPVA moniker. Like many ideas this one was founded in enthusiasm and the feeling that change would be a benefit to all of us. As the enthusiasm waned the lack of benefit became increasingly apparent. With vague guidelines, lack of volunteers to fill yet even more positions and no legal funding source the association of National Representatives had dwindled down to about 6 with only about 4 communicating regularly. With the passing years members felt alienated from the process of decision making about rules, events and direction. The HPVA board was often taken to task about the action or inaction of the IHPVA association. Confusion was compounded by the name change that was so similar. After much discussion and being actively lobbied by many members, the HPVA board decided to present to the membership at the annual membership meeting held in Battle Mountain, Nevada in 2006 the proposal to re-establish our original name and change the bylaws to reflect the change. The vote was unanimous. Please see the meeting minutes for both 2006 and 2007 for more details of the process. The “Statement of Resolution” also included in this newsletter outlines the many reasons for enacting this change. Ten years is a long time to wait for anything. There comes a time when the best thing is to acknowledge that something was not successful and move forward with what has been proven to work, our “association of individual members” was the brainchild of our founders and is still an effective means of structuring our non profit. One person = one vote allows for freedom to participate as much or as little as our members are inclined. With this system, any member can run for the board on an annual basis, volunteer for a number of necessary and important jobs, host events, participate in events, make record attempts, lobby the rules committee, or even be appointed to the rules committee. Or members don’t have to do any of those things, but enjoy the satisfaction of belonging to an organization that promotes human power and the technology behind all aspects of it. We would like to welcome back any and all members that were orphaned by the re-organization. National and special interest clubs are still a wonderful resource and fulfill local and regional needs but their competition rules vary widely as do design classifications. The IHPVA will continue to provide World Record competition rules and guidelines, keep records of those achievements and host events for International competition and participation. 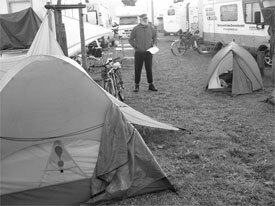 We will continue to publish this newsletter HPV News and the technical journal Human Power. These things are part of every membership in the IHPVA! 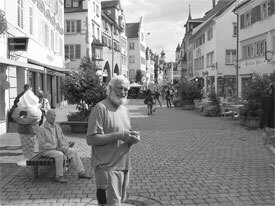 Half the week I am in Frankfurt and the other half I am in Giessen. I get to buy the old cab-bike no. 11, which has been ridden by maybe 500 riders. And every new part has been tested on it. One more day of epoxy and I can paint the inside and I (mit Bernd`s help) can start to reassemble it, with some of the upgrades that have evolved. Two weeks into it, I patched most of the holes and crashed areas. Bernd Krieger is very supportive of my rebuilding no. 11 (German thinks there will be near 100 cab-bikes built by the end of the year). I think I may have picked out the last piece of gravel from my “High Speed Crash” at the Velomobile Meeting 2007. After 6 weeks I now own cab-bike no. 11, or it owns me. Still fiddling with a few things. German and Bernd of Cab-bike got me into Reinhold’s old bike. Has been ridden, been in a few wrecks, had many tests and been used in a few experiments, but it is up and rebuilt. Bernd set me up. I slept on the couch 3 days a week for a month and spent long days in his shop. His wife Bea and two kids were very gracious to me. I have been riding around Frankfurt the last two weeks and trying to finish it. It is not quite right for me and the battery might be bad. A plastic liner in the back and I can load it with gear, and get going. The weather does not affect my riding so much now. I am feeling pretty good and need to ride. But a good question has come up. How do I get it to the West Coast? How do the guys ship the streamliners to Battle Mountain? I would appreciate any feedback you have. I am hoping to holdout till the New Year. The dollar has taken a shot so I might have return sooner. Depends on what turns up . I still have my bent and gear, and the urge to ride, maybe Arizona. I have a cab-bike or it has me. It’s been the test ride bike for prospective buyers, test of new ideas, in a few accidents and well ridden. Bernd and Bea put me up let me use his shop, supplied me with tools, materials and advice and trucked me back to Frankfurt. Wow. 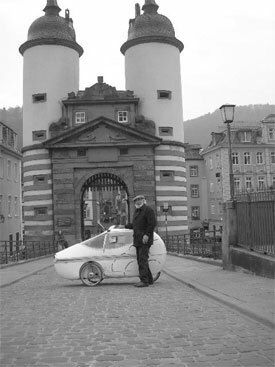 Velomobile school. 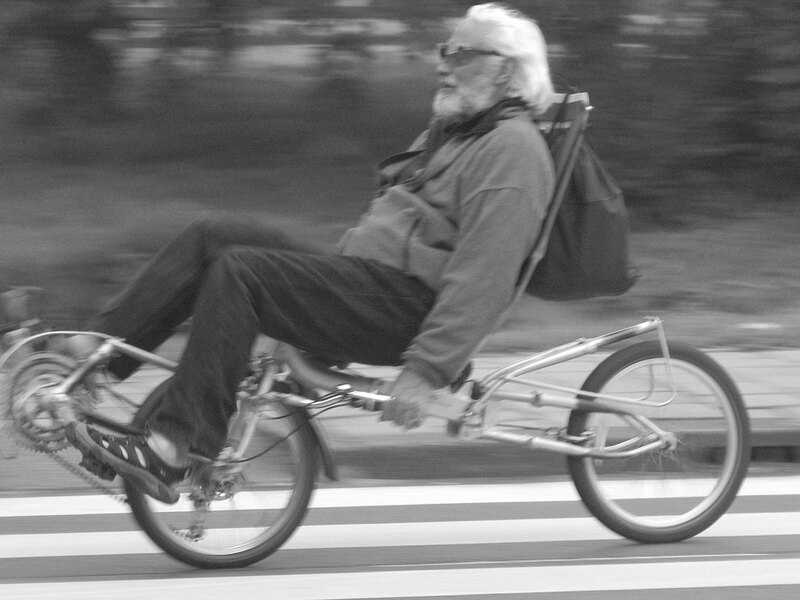 Recumbents and Velomobiles are what I came for. So I rode around Frankfurt for a month. Little kids chase me, guys follow me on their bikes, cars stop, people gawk and ask where I came from. I say outer space. It’s a chick magnetic. If I was only 29. Then needed a longer ride, so I over loaded it. 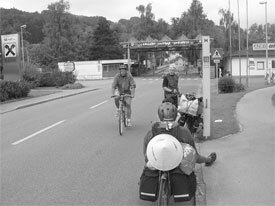 It was hard to close the top, and rode to Heidelberg in one day. The right front wheel would shimmy at higher speeds, so it was a long slow ride. I adjusted the steering incorrectly and will readjust it. You know the issue of shipping it. I went with my friend Barbi to mail some things at the Military PO. On inquiry it seems they can ship parcels of 130 inches and less than 70 lbs. I think I can take the cab-bike apart and pack it into two boxes to meet the criteria. Then ship it to my Mother as a gift. The other issues are. The campgrounds are closed, the dollar has taken a shot, and my mother is doing the hospital thing. So maybe I should go home until the Spezie next year. Maybe we could design a West Coast Velomobile and I could bring one back for the Spezie, or maybe just go to Spain and tan. If the cab can be in the mail, then I am free to move. I want to visit Jonathan in London and Alec in Southport and Peter in York but England is underwater. Hope all is well with you and yours. Happy Holidays. Say hey to Alice. Attached, I hope, are a few pics. Hey again. I am still trying to send the cab home. No luck yet. I even packed it up as small as I could to see if it would work. No way for the post office unless I cut it in half. Then I could send it through the military post, might be the least expensive. I tried to email Hans in Nimejen and have an incorrect email address. Would you send me his email? Jonathan sent me one but the letter came back. Jonathan also said he was bringing up a streamliner, and sent some pics of it. It looked good. If only England was not underwater. Well home is underwater, so I guess what’s the difference? I must get the cab back to the states. Who else has shipped a Velomobile from Europe? Thanks. The more I explore the options the more expensive it gets. We are still checking on shipping from Homburg and Rotterdam. It seems that 2000 Euro is not unrealistic. Yikes! it could cost more than the cost of the cab or to ship me home. If I could shorten two of the boxes each by 40 inches or so they would qualify as a package. 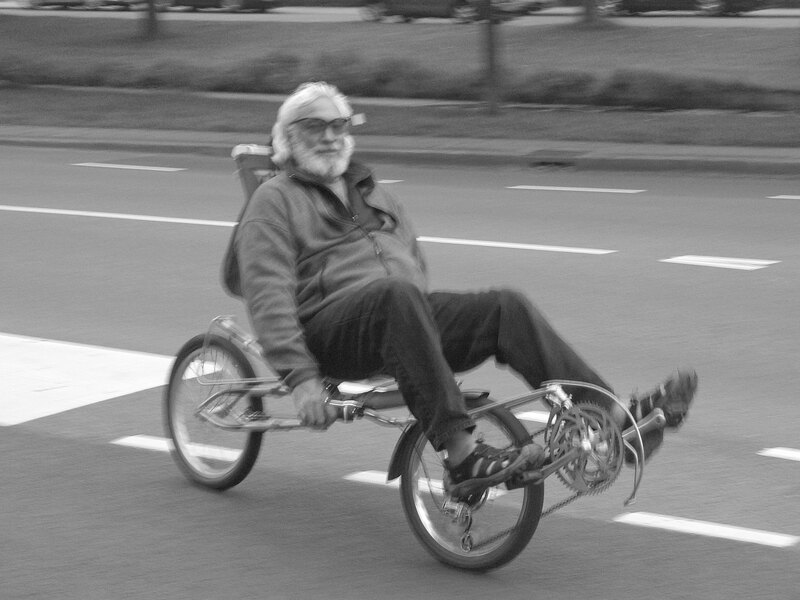 Since it is in pieces it is now used Velomobile parts and not a Velomobile. If I cut in front of the steering axis on the bottom section, when I reconnect it I could straighten the nose that has sagged from accidents and repair. The cost might be around 500 dollars then for three boxes. Doing some measurements today. Folded bent ready for travel. In front of guard gate, on the old bridge in Heidleberg. Test riding the “five fork bent”. Check Station on the way to Austria. 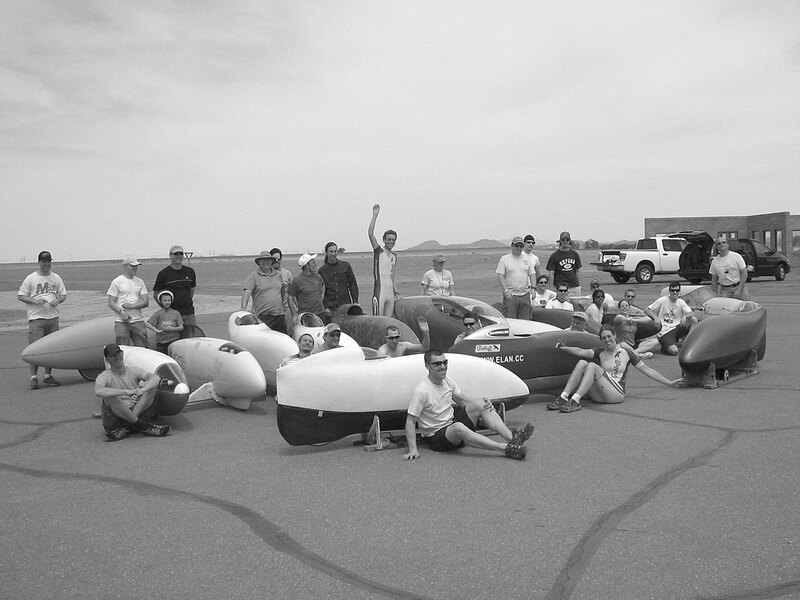 The Nissan North America Test track once again generously allowed the HPVA to host the Human Powered Hour Challenge on their proving grounds in Standfeild, Arizona. 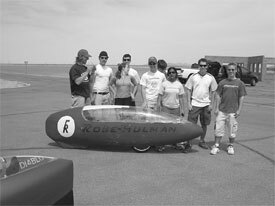 The 10,000.00 prize money offered by Paul MacCready of Areovironment enticed 20 racers to attempt to break the new World record set by Fred Markham of the US, in 2006 of 53.43 mph. The cooler weather of April was welcomed by all that had endured the July heat last year. The track was open to racers and spectators for three full days. On day one no one completed the full hour. Day two saw five completed hours with the highest distance of 52.304 going to Damjan Zabovnik of Slovenia. This left day three as the battleground between the world’s fastest. Sam Whittingham of Canada, edged past Fred’s record with a final distance of 53.917. Rob English of England, set a new British record with the wild ride of his life of 50.105. (for more details see Rob’s blog at http://rob.bikerevuk.com/racing/ nissan07/hour07.html) Ellen Van Der Horst (Van Vugt) of the Netherlands, squeaked past Tanya Markhan of the US, to win the 1st Place Women’s prize and Jacob Massen of Germany established a new Junior record of 43.265 mph. A 200-meter course was set up on the back straightaway with the front stretch and turns 1 and 2 for run up. Wind conditions were gusty and temps were in the 90s. While this was a fun diversion to the hour no world records were in danger of falling! Many thanks to all the volunteers who helped make this event run smoothly, to Mike Bourne and the Nissan crew for being such gracious hosts, and to Paul MacCready for his continued support of Human Powered record attempts with the donation of prize money. For more details see HPVA.us/Nissan. 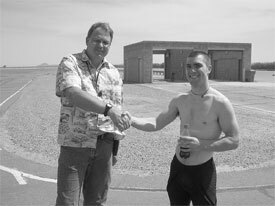 Mike Bourne Operations Manager at the Nissan Proving Grounds shakes hands with Sam Whittingham the new One Hour World Champion. 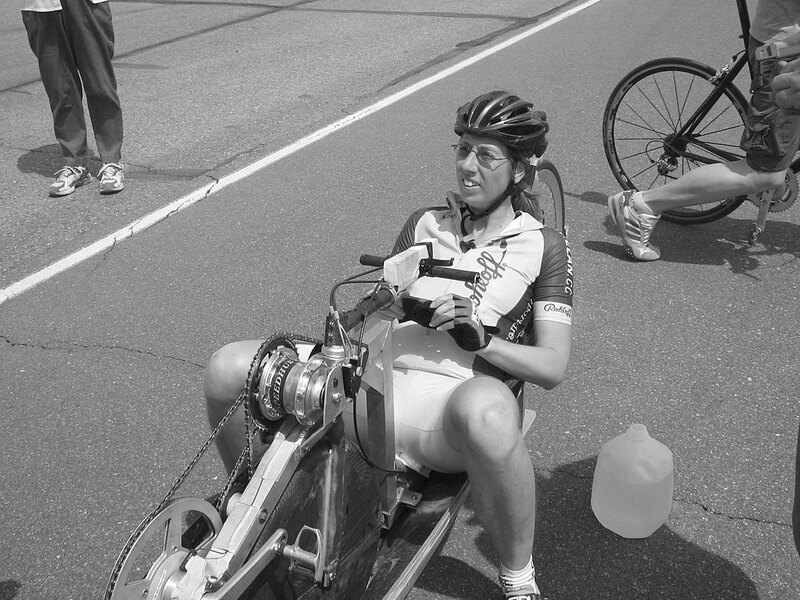 Ellen Van Der Hurst (Van Vugt) waits for a chance at the 200 -meter course. 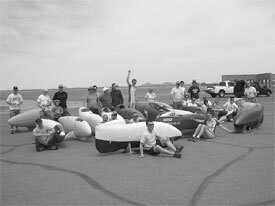 A pod of streamliners and their crew. Team Rose-Hulman poses for a group photo. Team Whitehawk Ellen Van der Horst, Hans Wessels, and Jakob Massen. Rob English demos the “full Lock” arm position he held to combat the 25+ mph winds during his wild ride. 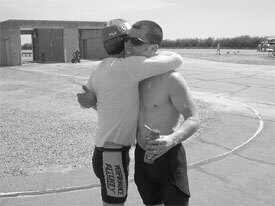 Sam Whittingham congratulates Rob English on his new British record. 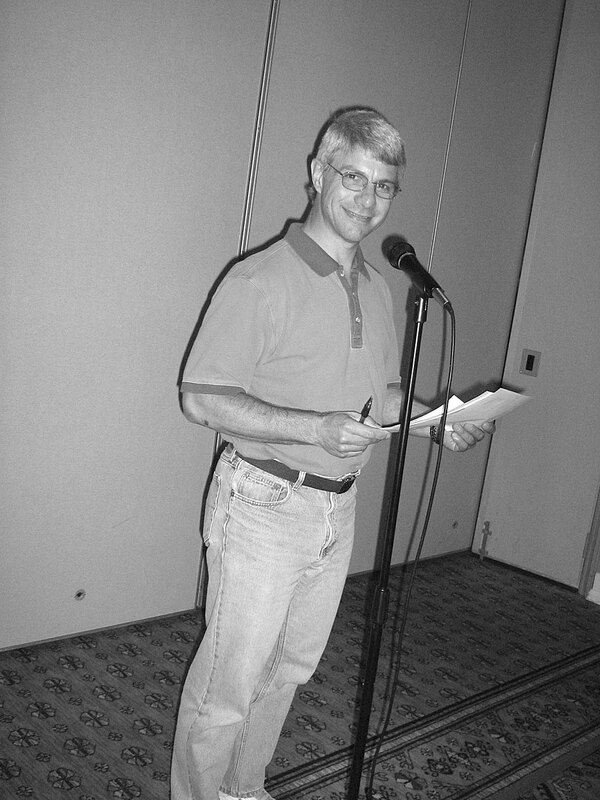 Tom Novak “Mr 50/60” head timer and MC. The Nissan DempseyMacCready One Hour Challenge lived up to all the preparation and anticipation by providing suspense and surprise up to the final moments on Sunday July 2, 2006. Riders requested stops to check specific aspects of the track condition and discussed optimum lane usage. Damjan Zabovnik rider and builder of Eivie stated the track was much rougher than he had anticipated and did not think he would ride on the first day, preferring to see how the other vehicles performed before attempting the course. Mike Bourne, Operations Manager at the track arranged for everyone to assemble at the front gates at 4:45 am Friday, June 30. We were to come and go only as a group, waivers were signed by all attending to be allowed on the premises and the OK was given for use of cameras during the record attempt. Thursday evening a riders meeting was held in the lobby of the Francisco Grande Resort former spring training ground of the San Francisco Giants where Chet Kyle had made arrangements for us to stay. Chet announced the time of the awards lunch on Sunday and introduced Paul MacCready to the group. Paul had generously agreed to give his speech “Doing More With Much Less” as an extra bonus to the ceremonies! Friday morning our alarm didn’t go off! We were jolted awake by the ringing of the phone at 4:15. Chaney Delaire was calling for directions to the track. We got ready in record time! What a way to start! Carpools were formed and a caravan left the motel. A stiff breeze was blowing from the Southwest that gave us some worries. Check in went smoothly and we were escorted to the track. 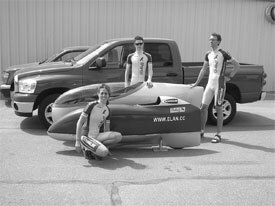 Timers Bill Gaines, Tom Nowak and Brenton Gaines readied the equipment while Rob English prepared to ride the Varna II for builder Dave Balfour. Local residents Ron and Lori Johnson had generously opened their home and shop to competitors. Dave, Becky Aulenbach and Rob had arrived early and taken them up on their hospitality giving Rob the opportunity to test the bike for the first time. Rob started smoothly and began circuiting the track with average lap times of 47.58 mph. (76.57 kph) The wind having died down with the sunrise made conditions perfect. Paul Gracey and crew sped off to video Rob’s progress. Nissan employees, reporters and photographers new to Speedbike racing were in awe as the first lap was completed. 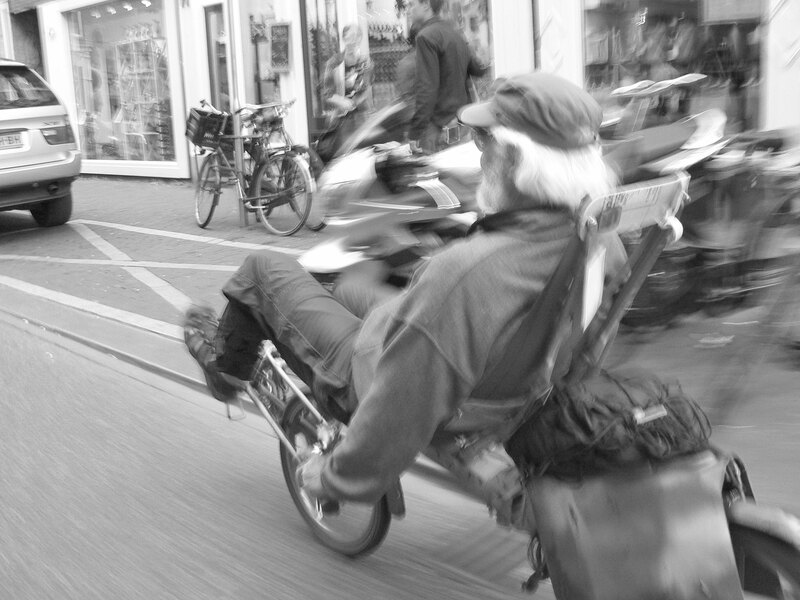 We forget how amazing it is to see the vehicles whoosh past, so smooth, so quite, so fast! Lori Johnson came up to me and showed me her arms covered in Goosebumps! Rob completed his run with a total distance of 49.84 miles (80.19 km) much faster than Damjan’s prediction that no one would be able to achieve over 45 mph due to the condition of the track. Obviously exhausted and overheated Ron was peeled out of the Varna II and attended by his crew. Track temperatures were already over 80. Steve Delaire was ready to take his turn at the one-hour attempt in the Mach 5 (formerly the Big Gun). The new flame paint job on the fairing was the envy of not only the other racers but commented upon by Nissan officials as well. Steve’s wife Chaney and his brother Craig launched him without incident and he began his first lap. Steve’s goal was to attain 40 miles for a personal best. George and Carole Leone’s rented PT Cruiser rode chase. Steve’s somewhat slower lap times allowed everyone to settle in and exchange information and speculate on what the next two days would bring. Reporter and photographer from the L.A. Times Preston Lerner and Ian Logan, Wired Magazine’s James Lee, Sian Kennedy and Keith Hedgecock, and Maria Fotopolis from Whole Life Times circulated the group for background and details. After four laps Steve called his crew on the inboard cell phone telling them to get a catch team ready. He was coming in early. Al, Mike Sova and I positioned for the catch. Steve sailed in like a pro and as we untaped him he said he was concerned about overheating and wanted to make another run on Sunday after he had worked out a better cooling system. There was a meet and greet with the racers and Nissan employees after the finish of the first day. Racers got to answer all the questions about their bikes while the rest of us got to brag about what a great organization the HPVA is. Designers, test drivers, safety and durability testers, emergency response personnel, executives and retired employees from Nissan were all amazed at the achievements attained solely through human power. Saturday morning came early at 3:45 am the carpool to the track went smoothly but the weekend crew at the Nissan gate were a bit concerned with admitting such a large convoy, especially after we said we were permitted to bring cameras in! Fast Freddy Markham, new owner of Easy Racers, took the first time slot of the day. Sporting a black Varna with red, white and blue canopy Fred intended to run without a cooling system. Gabe Devault and Tanya Markham gave their best shot at a launch but Fred not having gained enough speed lost his balance point and skidded on his side. The 15-meter launch rule was being strictly enforced and Fred had to restart at the line. 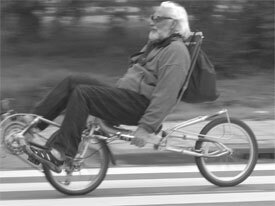 Those of us who have seen the speedbikes go down were unconcerned other than to grieve all the hours spent on the final finish of the vehicle. Others uninitiated to the likelihood of bad starts were assured Fred was unhurt and most likely hopping mad, which for those who know and love him acknowledge actually makes Fred ride more aggressively! As agreed Damjan wanted to ride at the same time as Fred, his start time scheduled three minutes after Fred’s launch. While Damjan and crewmember, Jacek Kesy prepared it became obvious Fred would be coming to the start before he was ready. A decision was made to have Damjan wait a lap. As we spotted Fred rounding turn four some quick action was needed. Deciding to wave Fred to the outside lane and step on the timing tape as he went by, Bill Gaines gave directions for everyone to clear the track. Suddenly with Fred closing fast we realized he intended to go over the wire and “shoot the gap” between Damjan and the inside lane. Al was shouting, “Stand still! Be a pylon!” so no one would accidentally step in front of Fred as he screamed by. What a rush! If we were all wearing heart rate monitors they would have been pegged! An immediate consensus was made not to allow any staging on the track for future runs. Damjan then launched without a problem and accelerated quickly toward turn one. After 12.32 miles into Fred’s attempt the chase car radioed he had gone down on the track. 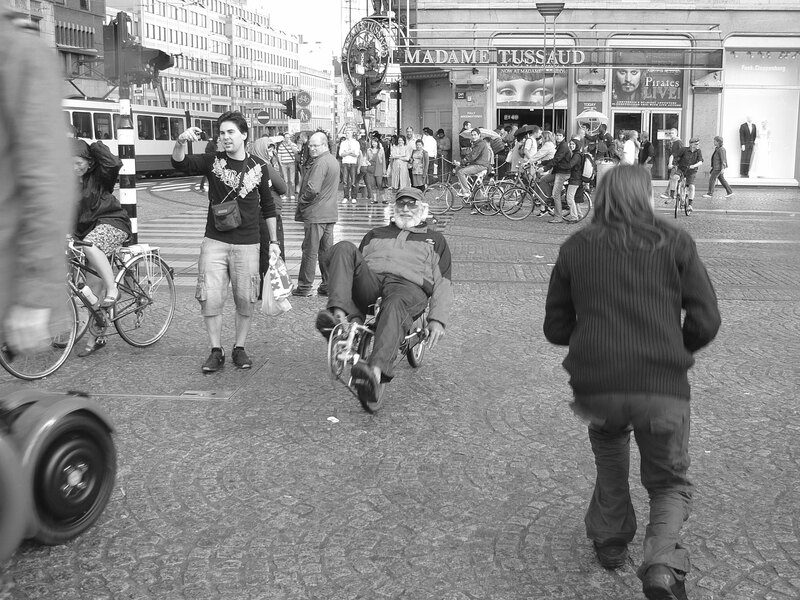 After bringing Fred and his bike in it was determined the mid-drive had come loose and caused a mechanical failure. Disappointed, Fred decided to run again on Sunday. With Fred no longer on the track Damjan continued to accelerate with each consecutive lap. Chet Kyle announced he was on a record setting pace heading toward a new World record. With the Eivie smoothly racking up the laps we were all waiting to see if Damjan would best Sam Whittingham’s current record of 52.34 miles. With only 11 minutes left to complete the hour the radio from the chase car called in “Damjan down!” What Happened? “Front tire flat!” Oh no! Will he run again tomorrow? After Damjan was brought back to the start he was visibly upset. So close! With no spare durable enough to with-stand the rough course he was certain he would not be able to make another run. Everyone began working on acquiring a replacement tire. Calls to bike shops and friends in Tucson to no avail. The tire was too specific to find in such short notice. How disappointing. Rob Hitchcock recently loaned the Kyle Edge by Matt Weaver was third to start on Saturday. The process of fitting into a Weaver made bike is rather like fitting a fighter pilot into a cockpit. Assisted by crew Carl Mueller, Raymond Gage, Ruben Bernardino, Jeff Bales, Matt and John Weaver Rob started slowly on his launch wheel. After gathering some speed and getting balanced the bike tilted and crashed. Re launching farther down the track saw some improvement but after going down before turn one Rob called off any other attempts. Fourth on the track Saturday was Craig Delaire. Although not a contender for the Dempsey-MacCready prize, Steve wanted to see how his brother would perform on a large track. With a clean launch Craig completed a full hour with a distance of 36.29 miles (58.39 km) being only the second rider to finish the entire hour. Now of course Steve would have to best his brother on Sunday. Sibling rivalry can be a great motivator! That evening at the riders meeting it was announced that due to the confusion at the gate that morning and our delay in starting Mike Bourne had invited us to be at the track by 4:30. This was a mixed blessing since we had four riders scheduled, but meaning we would have to get up even earlier! Anticipation was high on the final day. We had received word from Germany that both Hans Wessels and Lars Tuetonberg had not been able to best the existing records on the Opel test track. This added plenty of pressure on Rob English, Fred, Steve and Matt. Fred and Rob had chosen to run on the track together. Rob to be launched three minutes after Fred. Once again Fred was dropped and restarted causing just enough stress to get his adrenaline pumping to hammer out a clean second attempt. With Fred about halfway around the track Rob was launched and both he and Fred began swooping by in alternating rhythm. Five laps into the hour Rob’s chase car radioed Rob was slowing and to get ready to catch him. 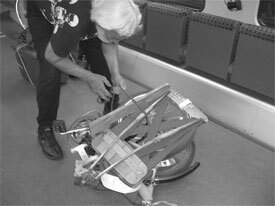 After untaping the fairing Rob said his cooling system had failed, his drinking tube had become detached and pointed to his leg where an untrimmed zip tie was raising a red welt along his inner knee with each rotation of the cranks. “Too many things” he said, apologizing to Dave and Becky. With Rob off the track and Matt yet to run the pressure was now on Fred who was pulling down record setting laps with consistent times that varied by only mere seconds. Adjacent to the track Matt’s team was working feverishly to ready the Cutting Edge, while Steve Delaire began warming up for his second attempt. Fred’s final lap was counted down over the radio to the chase car. 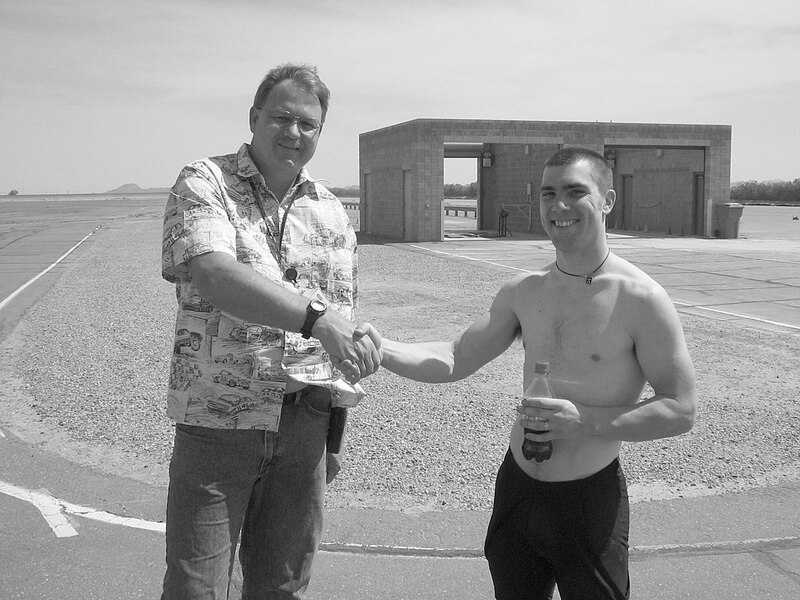 Bill Gaines calculated his distance and announced Fred had broken the record held by Sam by over one mile with a total distance of 53.43 miles (85.97 km)! After opening the bike and getting Fred cooled down, Tanya Markham announced, “You just got a new world record Daddy!” As reporters and photographers gathered to interview Fred we began readying Steve on the track. The Mach 5 sailed onto the track and began covering lap after lap without a hitch. Steve, once again looking for a personal best of 40 miles. With a fastest lap time mid hour of 50.04 it looked like he would achieve his goal. With his final lap counted down and the hour completed Steve actually put out the fourth highest distance of the meet of 43.27 miles (69.45 km)! Bragging rights over Craig, priceless! Watching the Cutting Edge readied for Matt’s ride was nerve wracking. The track was heating up and the wind had picked up slightly. All team members were head down working on final details. Some Nissan employees had even lent a hand. Matt needed to be on the track no later than 8:50 leaving just enough time to clear the track by 10:00. 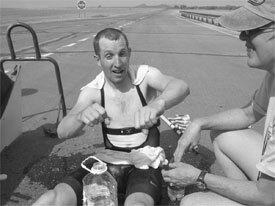 Before climbing into the bike Matt had pre-cooled his body by lying in a large trough of ice water. The water looked pretty inviting to the rest of us that had been standing around in the heat as well! Climbing into the Cutting Edge Matt took direction from Rob Hitchcock. While adjusting his head strap and attaching the cooling system and drinking tube they realized the bladder for the drinking water had been forgotten. “You have no water Matt,” Rob stated. With no time to spare the decision was made to remove the speedometer also rather than hook it up. The fairing was now ready to be shoehorned over Matt and the chassis. “ Up, up! No, back a little. OK forward to me,” Rob guided the team. While the final screws were set in place and air holes taped over Matt could be heard shouting from the interior of the bike. “You’re going to have to go with what you have Matt” Rob said, knowing there was no time to reopen the bike. As his team guided him toward the start line we held our breath as he set off on his jockey wheel. It appeared he had cleanly launched when he veered off and skidded on his side. 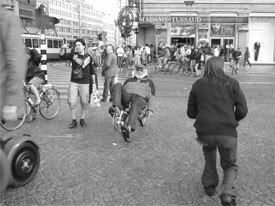 Running to assist, his team righted the bike and got him restarted. This time, although slow, Matt remained upright and headed toward turn one. Now the questions began flying through the group. Would Matt complete? Would he best Fred’s new record? Without a speedometer would he be able to judge his speed? Would he overheat without drinking water? With each lap it became apparent Matt was not on record pace. Fred was able to relax somewhat but knew “it ain’t over ‘til it’s over”. The hour continued to tick away until the final countdown. Our catch team was waiting on the track as we spotted Matt rounding turn four. Watching for signs of slowing we realized Matt was still at speed, I yelled, “He’s coming in hot!” We all got out of the way and watched the bike race toward turn one.” Bill we need your truck!” Al shouted and he and Bill Gaines took off after Matt to assist in bringing the bike back to the start. As Matt was helped from his bike he said his cooling system had failed as well as his primary video monitor, with visibility down to a two by two inch screen he was coasting through the turns at times. He did not appear overheated at all so the ice bath must have been a good idea. Matt had finished his hour with a distance of 48.67 miles (78.31 km). Second in the meet but putting his previous record down to third place for the DempseyMacCready prize. We all congratulated Fred once again and packed up our gear. Thanking all the friendly Nissan helpers we headed back to the Hotel where the awards luncheon was to begin at noon. The Francisco Grande had set up a large banquet room for our awards lunch. After dessert Chet Kyle introduced Paul MacCready as patron of the DempseyMacCready prize and guest speaker. After the conclusion of his speech “Doing more with Much Less” Paul presented the awards for the One Hour Prize. 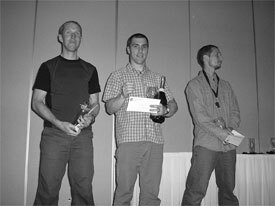 Additional prize money was awarded to Damjan Zobovnik (4,000.00) and Rob English (2,000.00) for traveling such a long distance to compete for the prize. Total prize money awarded by Paul MacCready 40,000.00. Paul’s generosity and dedication to the HPVA has spurred development and competition for years. We were lucky to have had this opportunity at Nissan to provide a final setting to the conclusion of the prize. The HPVA also gave awards to the riders at the event. All riders, committee members and Nissan representatives were give medals, hats and T- Shirts commemorating the One Hour Challenge. Third Place, Rob English and Second Place, Matt Weaver received etched glass beer steins. Fred Markham, First Place received a larger stein and a bottle of Champagne to fill it! We hope Nissan will invite the HPVA back to the track again. Watching history in the making is thrilling! Thank you to all volunteers, prize committee, riders, Nissan employees, HPVA supporters and especially Paul MacCready for making this a memorable event!